Shrek is an animated movie based upon William Steig's 1990 fairy tale picture book called Shrek!. The name Shrek likely comes from the Yiddish word שרעק (pronounced Shreck) or the German word Schreck. Both words mean "fear" or "terror". It was directed by Andrew Adamson and animated by DreamWorks Animation SKG from 1998-2001. It was the first movie to win an Academy Award for Best Animated Feature, a category introduced in 2001 . It was released on DVD on November 2, 2001. There have also been three sequels (follow-ups) of Shrek, called Shrek 2 and Shrek the Third and Shrek Forever After. There is also a Christmas special, a Halloween special and a spinoff movie all about a minor character in the sequels and specials. There's also a Broadway musical based on the movie. Shrek (voiced by Mike Myers) is a green ogre who always loves living peacefully in the swamp. However, he finds many fairytale creatures disrupting his privacy. This is because of the order by Lord Farquaad (voiced by John Lithgow). Shrek goes along with Donkey (voiced by Eddie Murphy) to ask Farquaad to give his privacy back. Farquaad wants to be King by marrying Princess Fiona (voiced by Cameron Diaz) to be Queen. Farquaad orders Shrek and Donkey to travel for Fiona and bring her to Farquaad. After trying to get Fiona from the castle, Fiona is happy that she is rescued, but soon becomes sad that the knight is an ogre. Shrek forces Fiona to travel with him and Donkey, with Shrek and Fiona finding they have more in common with each other along the way, and falling in love. However, at night, Fiona refuses to camp with them, taking shelter in a nearby cave until morning. Shrek and Donkey stay awake and watch the stars while Shrek informs Donkey that he plans to build a 10-foot wall around his swamp when he returns. When Donkey keeps on asking Shrek why he is doing this, Shrek sadly tells him that everyone judges him before they know him; so he thinks he is better off alone, despite Donkey's saying that that he did not immediately judge him when they first met. The next night, Donkey finds Fiona in a windmill. Donkey finds that Fiona has turned into an ogress. She tells Donkey that she was cursed as a child and turns into an ogress every night. This is why she was locked away in the castle. She also says that only a kiss from her true love will return her to her "love's true form". Shrek, about to confess his feelings for Fiona, overhears part of their conversation, and is heartbroken as he misinterprets her disgust at her transformation into an "ugly beast" as being disgusted with him. Fiona makes Donkey promise not to tell Shrek about the spell, vowing to do it herself, but when the next morning comes, Shrek has brought Lord Farquaad to Fiona. The two return to the castle, while a hurt Shrek returns to the now-vacated swamp. After finding out that despite is privacy that he misses Fiona very much, Donkey gets mad at Shrek, and Shrek tells Donkey that he overheard their conversation. They both travel to Duloc quickly, thanks to Dragon, who had escaped her confines and followed Donkey. They interrupt the wedding before Farquaad can kiss Fiona, but not before the sun sets, which causes Fiona to turn into an ogress in front of everyone. While her transformation causes Shrek to fully understand what he overheard at the windmill, Farquaad, disgusted over the change, orders Shrek killed and Fiona imprisoned, but Shrek whistles for Dragon, who bursts in and eats Farquaad. Shrek and Fiona admit their love for each other and share a kiss; Fiona is bathed in light as her curse is broken, but is surprised to find that she has remained an ogress, as she "thought [she] was supposed to be[come] beautiful", to which Shrek replies that she is beautiful. The two of them get married in the swamp and depart on their honeymoon while the rest celebrate by singing "I'm a Believer". Steven Spielberg bought the rights to the original book in 1991, when he apparently thought about making a traditionally animated film based on the book with Bill Murray as Shrek and Steve Martin as Donkey. After only a few years in development hell, producer John H. Williams got hold of the book from his children, and when he brought it to DreamWorks, it caught Jeffrey Katzenberg's attention and the studio decided to make it into a movie. After buying the rights to the film in 1995, Katzenberg quickly put the film in active development. The Art Directors visited Hearst Castle, Stratford upon Avon and Dordogne for inspiration on Duloc's place. Art Director Douglas Rogers visited a magnolia plantation in Charleston, South Carolina for inspiration for Shrek's swamp. The film was originally planned to be a motion-captured film. DreamWorks used live action background plates with miniature fairy tale settings that they had filmed, giving the film a very visual distinct look. After a year and a half of R & D, a test was finally shown. The result was a disaster, with Katzenburg stating "It looked terrible, it didn't work, it wasn't funny, and we didn't like it." Production was shut down for a while. DreamWorks later went to its production partners at PDI in Spring of 1997, when the movie Antz was still in production, to help Shrek get it's final computer-animated look. “We did a lot of work on character and set-up, and then kept changing the set up while we were doing the animation,” Ramon Hui noted. “In Antz we had a facial system that gave us all the facial muscles under the skin. In Shrek we applied that to whole body. So if you pay attention to Shrek when he talks, you see that when he opens his jaw, he forms a double chin, because we have the fat and the muscles underneath. That kind of detail took us a long time to get right." Saturday Night Live member Chris Farley was to be the voice for Shrek. He was able to voice around 80-90% of the script, although Chris' brother, Tom Farley, states that Farley had actually already recorded 95% of Shrek's dialogue for the movie, but died in 1997 before he finished voicing the character. Production was shut down again after Farley's death. Andrew Adamson stated "Chris Farley's death was before any animation had been done [although] we'd recorded an amount with him." 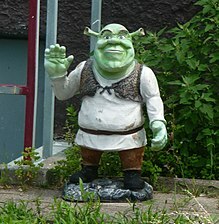 DreamWorks later asked Mike Myers to play Shrek, whom Myers wanted the writers to re-write the script to leave no traces of Farley's version of Shrek. After Myers had completed providing the voice for the character, when the film was well into production, he asked to re-record all of his lines in a Scottish accent similar to the one his mother had used when she told him bedtime stories. After hearing the alternative voice-over, Katzenberg agreed to redo scenes in the film, saying, "It was so good we took $4m worth of animation out and did it again." The film was entered into the 2001 Cannes Film Festival, and was the first animated film since Disney's Peter Pan (1953) to receive that honour. Shrek open in more 3,587 movie theaters on its 2001 release, 11 of them showing them digitally, made possible by the THX Division of Lucasfilm. This was the first time that DreamWorks had shown one of its movies digitally. Produced on a $60 million budget, Shrek was commercially successful, becoming the highest-grossing animated movie ever to be released in Australia, passing the mark set by 1994's The Lion King. In the United Kingdom, Shrek regained the top spot at the British box office after being beaten out the previous week by Lara Croft: Tomb Raider, earning a $20.3 million since its opening in the UK. The film closed on December 6, 2001, after grossing $267,665,011 domestically along with $216,744,207 overseas for a worldwide total of $484,409,218. Shrek is the fourth-highest-grossing film of 2001 behind Harry Potter and the Philosopher's Stone, The Lord of the Rings: The Fellowship of the Ring and Monsters Inc.
Shrek received critically good reviews, praising Shrek as an animated film worthy of adult interest, with many adult-oriented jokes and themes but a simple enough plot and humor to appeal to children. Review aggregate Rotten Tomatoes reports that 89 percent of critics have given the film a positive review based on 176 reviews, with an average score of 7.7/10. The general opinion is: While simultaneously embracing and subverting fairy tales, the irreverent Shrek also manages to tweak Disney's nose, provide a moral message to children, and offer viewers a funny, fast-paced ride. Roger Ebert liked the film, giving it four stars out of a possible four and describing it as "jolly and wicked, filled with sly in-jokes and yet somehow possessing a heart." USA Today's Susan Wloszczyna praised Eddie Murphy's performance, stating it "gives the comic performance of his career, aided by sensational digital artistry, as he brays for the slightly neurotic motormouth." Richard Schickel also enjoyed Murphy's role, stating, "No one has ever made a funnier jackass of himself than Murphy." William Steig, the author of the original book, and his wife Jeanne Steig also enjoyed the film, stating "We all went sort of expecting to hate it, thinking, 'What has Hollywood done to it?' But we loved it. We were afraid it would be too sickeningly cute and, instead, Bill just thought they did a wonderful, witty job of it." Shrek won the first ever Academy Award For Best Animated Feature, beating Monsters, Inc. and Jimmy Neutron: Boy Genius. Entertainment Weekly put it on its end-of-the-decade, "best-of" list, saying, "Prince Charming? So last millennium. This decade, fairy-tale fans--and Princess Fiona--fell for a fat and flatulent Ogre. Now, that's progress." Shrek was also nominated for 6 BAFTA Award, including the BAFTA Award for Best Film. Eddie Murphy became the first actor to ever receive a BAFTA nomination for a voice-over performance. The film was also nominated for Best Visual Effects, Best Sound, Best Film Music, and won the BAFTA Award for Best Adapted Screenplay. Shrek was nominated for a dozen Annie Awards from ASIFA-Hollywood. In June 2008, the American Film Institute revealed its "Ten top Ten"; the best ten films in ten "classic" American film genres—after asking 1,500 people for their opinions. Shrek was acknowledged as the eighth best film in the animated genre, and the only non-Disney·Pixar film on the top ten. It is also third on Bravo's 100 funniest films. Shrek was also ranked second in a Channel 4 poll of the "100 Greatest Family Films", losing out on the top spot to E.T. the Extra-Terrestrial. In 2005, Shrek came sixth in Channel 4's 100 Greatest Cartoons poll behind The Simpsons, Tom and Jerry, South Park, Toy Story and Family Guy. In November 2009, the character, Lord Farquaad, was listed #14 in IGN UK's "Top 15 Fantasy Villains". ↑ 1.0 1.1 "Shrek". Box Office Mojo. ↑ Hill, Jim (May 19, 2004). ""From the Swamp to the Screen" is a really entertaining look at the creation of the first two "Shrek" films". Jim Hill Media. Retrieved February 10, 2012. ↑ 7.0 7.1 7.2 Hill, Jim (May 16, 2004). "How "Shrek" went from being a train wreck to one for the record books". JimHillMedia.com. Retrieved August 3, 2011. ↑ Blair, Iain (May 5, 2001). "The Making of Shrek". digitalanimators.com. p. 2. Retrieved February 10, 2012. ↑ Anderson, Sam (2008-05-16). "Dada's Boy". New York Magazine. Retrieved 2008-06-08. ↑ Tilden, Imogen. "They made a monster". The Guardin. Retrieved February 28, 2012. ↑ "Mike Myers forces £4m rejig of Shrek". The Guardian. May 2, 2001. Retrieved January 28, 2012. ↑ "Shrek". Festival de Cannes. Retrieved October 18, 2009. ↑ "Shrek scores at the US box office". The Guardina. May 21, 2011. Retrieved February 7, 2012. ↑ "Shrek Opens on 3,587 Screens!". digitalmediafx.com. May 18, 2001. Retrieved February 12, 2012. ↑ "Taking Shrek Digital". digitalmediafx.com. May 22, 2001. Retrieved February 12, 2012. ↑ "Shrek to Air Digitally on 11 Screens". digitalmediafx.com. May 17, 2001. Retrieved February 12, 2012. ↑ "Shrek (2001)". Rotten Tomatoes. Retrieved August 13, 2009. ↑ Ebert, Roger (May 18, 2001). "Shrek". Chicago Sun-Times. Archived from the original on July 10, 2010. Retrieved July 10, 2010. ↑ Wloszczyna, Susan. "'Shrek' spins jokes from fairy tales". USA Today. Retrieved January 27, 2012. ↑ Schickel, Richard (May 21, 2001). "Cinema: Monstrously Good". Time Magazine. Retrieved January 27, 2012. ↑ Puig, Claudia (May 31, 2001). "'Shrek!' author exclaims his approval of film". USA Today. Retrieved January 27, 2012. ↑ Mishra, Smita (February 3, 2012). "Oscar Awards: The historical trail". India Today. Retrieved February 10, 2012. ↑ 25.0 25.1 25.2 "Shrek - Awards". New York Times. Retrieved February 10, 2012. ↑ American Film Institute (June 17, 2008). "AFI Crowns Top 10 Films in 10 Classic Genres". ComingSoon.net. Retrieved August 18, 2008. ↑ "Top Ten Animation". www.afi.com. Retrieved June 18, 2008. ↑ Parfitt, Orlando (November 12, 2009). "Top 15 Fantasy Villains". IGN UK. IGN. Retrieved February 10, 2012. This page was last changed on 4 April 2019, at 14:48.